Formed in 1992, Allpest are always dedicated to providing the most effective and economical pest control services. 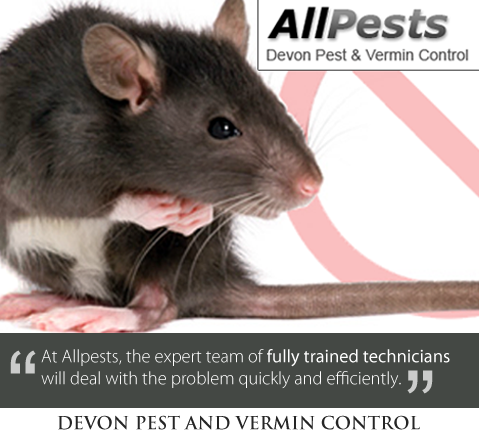 Allpests operate throughout Devon and Cornwall, providing a fast and efficient pest control service. Domestic homes and businesses can be home to all types of pests and vermin which can affect your health, quality of life and can cause a large amount of damage to your property. At Allpests, the expert team of fully trained technicians will deal with the problem quickly and efficiently. Woodworm, the larvae of the common furniture Beetle eat holes through wood. This can consequently be devastating and very expensive if left untreated. Not only can Woodworm damage your furniture, but they can also cause damage to beams, floorboards and structural timbers. Common pest control including woodworm, fleas, bed bugs, wasp nests, insect infestations, bird control, rodents.